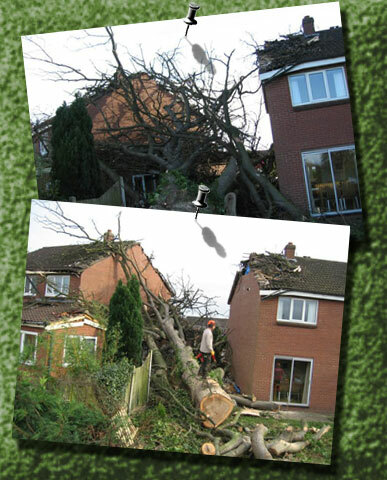 Storm Damage – Benbow Brothers (Timber) Ltd.
Every year hundreds of trees are broken, injured and felled by gales, storms, floods, frost and snow. When this happens on your property you need to know that the people you hire are qualified, insured, and equipped to remove the damaged limbs, branches (and whole trees if necessary) without causing extra damage to your home, garden or business. During the winter months small cracks and holes in a tree can become filled with ice and snow, damaging the tree and causing structural instability. 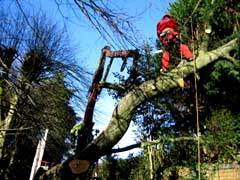 If you suspect your tree may be being damaged by the cold and ice you can contact us at once. Usually we do not charge for an inspection and all of our work is guaranteed and fully insured, so you know we will never make the matter worse for you, your family or your employees. Benbow Brothers has over 60 years of experience at site clearance and tree work and we have kept abreast of the changing face of arboricultural technology. This allows us great flexibility in terms of site accessibility and environmental impact. Contact us immediately to find out what we can do to help you clear your site from storm damage.